If you’re looking for an easy-to-grow summer blooming annual with lots of blossoms and lots of colors, look no farther than the unassuming little petunia. The petunia is actually a perennial, although it is generally thought of as an annual and is grown as an annual, producing an all-summer-long profusion of colorful blossoms. The petunia originated in South America, but over the years it has been transported to other temperate areas of the planet and hybridized and popularized as a gardener’s favorite in many locales. Although petunias can be started indoors from seeds, the easiest and most common way of procuring petunia plants for setting into your garden is to purchase young plants from your local garden center at the beginning of the late spring/early summer growing season. If you do choose to start your own seeds, this should be done at least 6 to 8 weeks before the last anticipated spring frost. This will give the young seedlings sufficient time to reach a desirable size for transplanting into the outdoor garden when conditions permit. 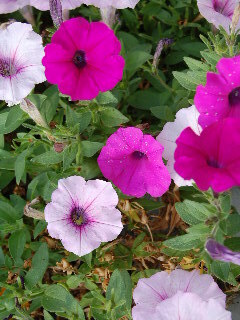 Petunias work well in a variety of growing applications. Planting directly into the garden soil of your flowerbeds or along walkways is a popular use for the young plants which will thicken as the growing season progresses, giving you an abundance of colorful blossoms set against a background of dense green foliage. Window boxes and container plantings on the patio are also good homes for your petunias, as are hanging baskets that allow the eager-growing plants to tumble down the basket sides and present a cascading display of bright blooms. However you choose to integrate your petunias into your gardenscape, just be sure to set them into locations which receive an abundance of full sun, as this is the most important requirement for assuring continued blossoming throughout the growing and flowering season. The plants will survive in areas of partial shade, but the production of blooms will be greatly limited. Feed your petunias a good balanced plant food about once a month to help stimulate growth and flower production. Also, as blooms expire and start to fade, remove them from the plants to further encourage new blooms. Petunias do well in a well-drained, loose, organically rich soil that is kept moist but not soaked. A light mulch in between the established plants helps to keep the surface of the soil from drying out too quickly between waterings. Not only will your petunias give you lots of blooms all summer long, but you also have a large palette of colors from which to choose. Violet, red, rose, white, yellow, and multi-colored varieties are available to be planted as masses of solid color or blendings of several colors together in the same flowerbed or container. As the season progresses, some of your petunia plants may become too leggy for their settings (other than hanging baskets). If this situation arises, just snip the individual plants back to about 3 or 4 inches. This will stimulate new growth and help the petunias to take on a denser growth habit even as they produce more blooms. 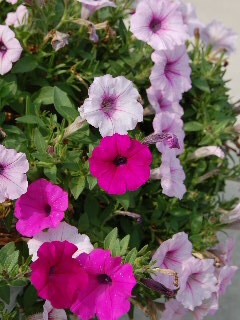 In addition to your petunias giving you many blooms in many colors throughout the entire growing season, another plus is that they are basically trouble-free plants, being little affected by insects or disease. Plant petunias freely about your gardening areas and enjoy their carefree summer show!